As their title suggests, these scales measure the difference between words. Prior research with members of the target group is undertaken to generate the 'constructs' or dimensions that people use when thinking about products and services. The semantic differential scale presents these bipolar constructs on a scale, with up to 20 scales on a page, forming an 'attitude battery'. The name of a brand at the top of the page appears, and the respondents are asked to rate that brand on each of the scales. Figure 6.2 shows an example. 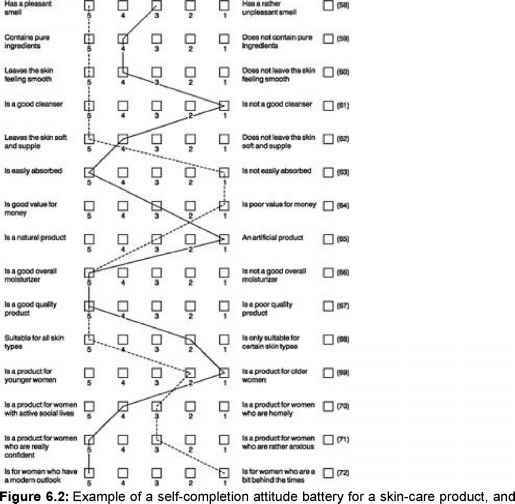 If a representative sample of respondents is asked to complete the same attitude battery, then the results can be computed and a 'brand profile' drawn. Brand profiles can also be drawn for other brands used in the exercise, and this can help to explain the strengths and weaknesses of brands in the marketplace, particularly when considered in conjunction with their sales figures. It is also useful to add to the attitude battery scaling exercise a set of ratings for 'your ideal brand'. The profile for this can be compared to the profile achieved for the company's brand in order to pinpoint ways in which the company's product differs most from the consumer's ideal. The profiles that might result for two brands of skin-care product are shown alongside the attitude battery in Figure 6.2. The data from semantic differential scaling can also be plotted on two dimensions simultaneously, showing how competing products, brands or services relate to each other in the consumer's mind. This technique can be computer based (see Chapter 10, Section 10.3.3) to make multidimensional maps of the consumer's positioning of products, and is called 'perceptual mapping'. It can indicate close competitors that the manufacturer may not have identified. In a perceptual mapping exercise on food, using data from a survey of housewives, the closest competitor to lamb chops was found to be fish fingers. It also indicates products that the manufacturer may have believed to be competitive, but which the consumer does not perceive as such. This kind of information is very illuminating both about market behaviour and for marketing strategy. Figure 6.3 shows a hypothetical perceptual map for canned beers. Can a perceptual map be developed based on semantic differential data?